* Beautiful pink Big Chinese Knot Embroidery Oriental Ornament Shoes Pendant. * Shoes Pendant Chinese Knot or Chinese traditional decorating Knot is a kind of characteristic folk decorations of handicraft art. * Chinese Knot has now become a kind of elegant and colorful arts and crafts from its original use. 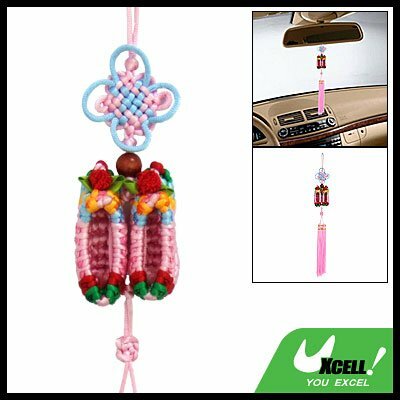 * This Chinese Knot with Shoes Pendant can be a beautiful decoration for your home, and hanging in the car, door, bring good luck. * Gift for friends during eventful days such as Christmas Day and birthday, share wishes together with your close friends.